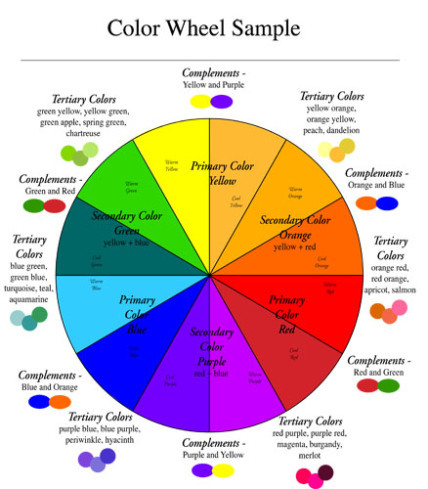 Complements are opposite each other on the color wheel, the complement pairs are red and green, orange and blue, yellow and purple. The following example is another way to remember it by visualizing how the colors are made. Primary colors are yellow, red and blue. Let’s pretend that you can make all the colors in the world with these three colors. When you want an orange, you mix red and yellow. When you want a green, you mix yellow and blue. When you want a purple, you mix red and blue. To make complements you need to remember these three primaries: red, yellow and blue.